My brother bought me a beautiful amber colour ceramic Pyrex dish a couple of years ago. Till then I'd always assumed that Pyrex only made the classic transparent glass dishes. I was thrilled to have this rustic looking beauty and imagined a series of comforting bakes and puddings that this would be perfect for. I love having beautiful things in my kitchen - dishes, serve-ware, bake-ware, spoons, anything! I also like to use my stuff. What's the point of having tons of stuff if you never use them? If something breaks I do feel terrible but I know I used it and enjoyed it to the fullest. This heavy pottery Pyrex dish had been sitting in the cupboard barely used but now I'm making up for the months of neglect! The hubby is just recovering from a nasty bout of malaria and I've been trying to feed him up a little without piling on too many of the calories, trying to keep things yummy but not heavy. 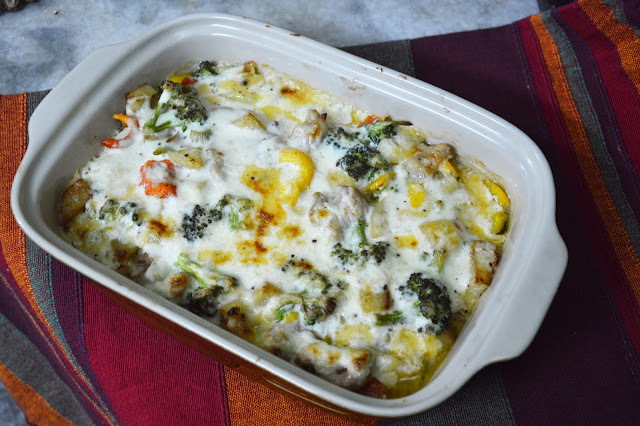 Loads of vegetables, a smattering of chicken, some cheese and a light and creamy white sauce baked to a mild brown crust has become one of his favourite dinners these days. In less than a month I think I have already made this three times. It's easy, packed with goodness and is as delicious as ever. 1/2 cup cheese, cubed. Gouda works very well. Heat up a tablespoon or two of olive oil in a non-stick wok. Sauté the chicken cubes lightly till they look opaque. They don't need to be completely cooked, just let them loose the raw look. Remove to a baking dish. In the same oil put in the potatoes and let them fry nicely for 4 to 5 minutes. Add the broccoli and stir around for another minute or two. Put in the corn and the courgettes, stir for another minute and then tip in the mushrooms. Let the veggies cook till most of the mushroom water has evaporated. Remember to season with salt and a generous bit of fresh pepper. I have a selection spice blends that I use often in such dishes. Mince spice, Cajun spice, steak seasoning, Barbecue rubs, etc., that are not sauces but are dry spice mixes. I like to sprinkle a generous teaspoon of any of these into the veggies. If I'm using these then I reduce the salt that I add separately as these mixes usually have added salt too. A generous pinch of mixed dried herbs also works very well or you can crumble in a flavour cube if you like. Just salt and a lot of fresh cracked pepper also works very well. Add a couple of cloves of chopped garlic if you like. 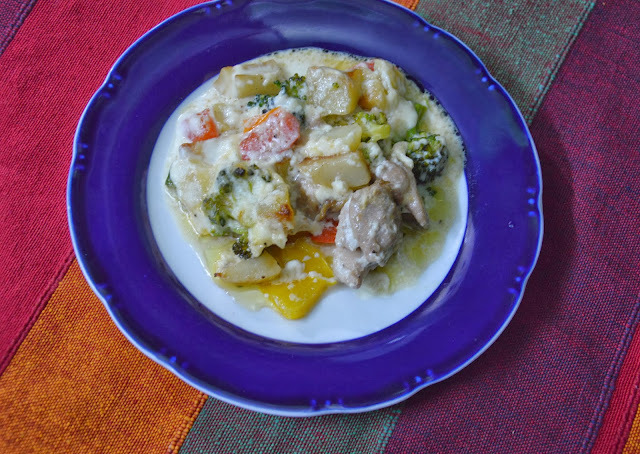 I add the coloured peppers last and cook them just for a minute at the most. 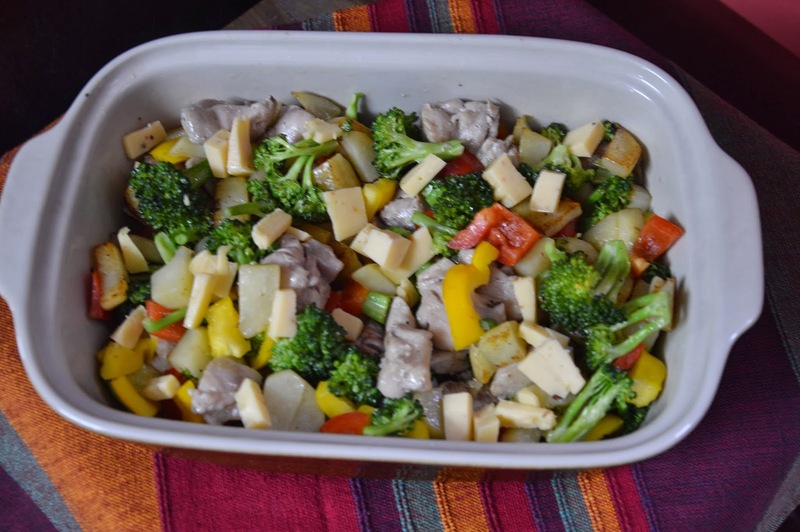 Pile the veggies onto the sautéed chicken pieces in the baking dish. Scatter the cheese cubes all over. Switch on the oven and set it at around 180C. 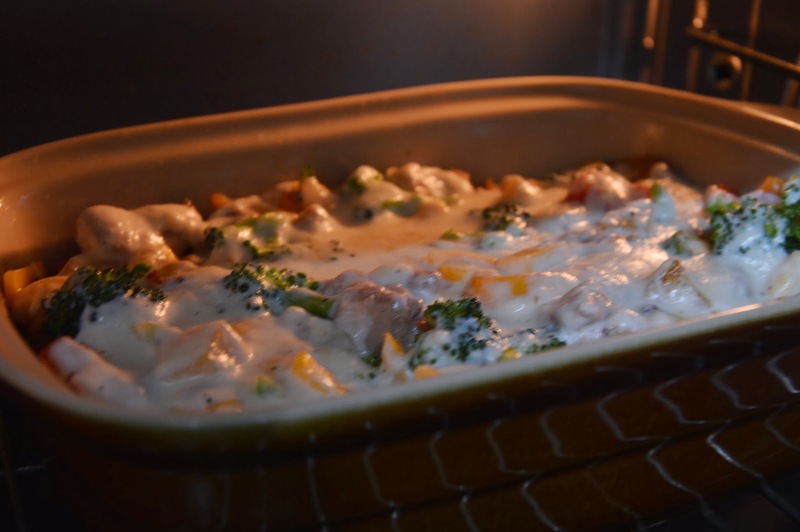 Make a thin white sauce using the butter flour and milk. 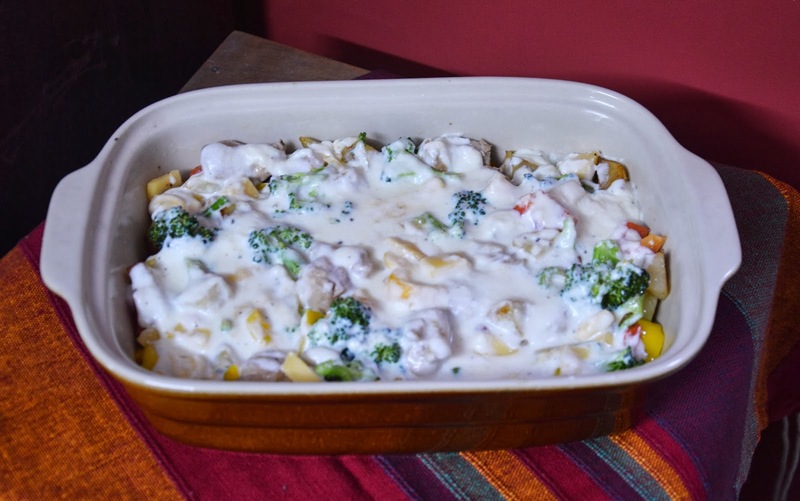 You can grate a little cheese into the sauce or even posh it up with some cream. Don't forget to add a little salt and good shake of pepper too. Pour the white sauce over the veggies and try to cover the entire surface. Put in the dish to bake for roughly 20 minutes in the hot oven. I don't let the surface become a very dark brown, just a few dark bits here and there are enough. Since the sauce is thin there won't be a lot of browning anyway. Serve hot with a crusty baguette and a little butter, or just plain toast. Such a colourful dish baked and served in equally beautiful dishes! Am sure Kurush must have relished it ! Rhea this looks so delicious, I make a pasta with veggies in white sauce which I love. Yours therefore I know I will love. Will try it with just veggies and let you know.